Pure, delicately fragrant rosewater steam-distilled from handpicked rose petals Genuine and all-natural, with no artificial fragrances or other additives Cools and hydrates skin while nourishing with age-defying antioxidants Thousands of rose petals go into this bottle, and each one is treated with the care needed to create a truly premium rosewater. 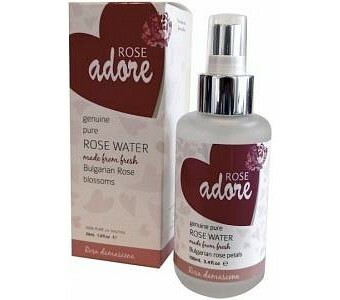 They come from Bulgaria’s famed Rose Valley, where they’re handpicked at dawn for maximum freshness and then steam distilled directly into rosewater – unlike many inferior products, Rose Adore Rose Water is not made from by-products of rose essential oil production, and it contains no artificial additives. It has a subtle but lovely and lively fragrance, and the fine mist is a wonderful refresher for tired, dry skin. The gentler production methods preserve a bounty of natural antioxidants that add to the restorative effect and help prevent premature skin ageing.